So it’s with a little trepidation that I’m going to write this post as, to be frank, the intention of the His and Hers was never to wade into geopolitics or issues of a contentious nature but to write about stuff that’s interesting and (hopefully) informative. Now having been laid up for the last few days with a rather weird ear infection which made leaving a prone position seem like I had been instantly transported back to Friday night, I thought I might as well use the opportunity to binge view old DVDs. If you haven’t heard of the #Kony2012 campaign and the associated repercussions in the last month or so, it’s likely you haven’t logged on to Twitter or Facebook for a while, and probably don’t know any teenagers. Through the whole Kony /Invisible Children media furore I was surprised that the documentary War Dance wasn’t widely referenced. Released in 2007 and nominated for an Oscar, it tells the stories of Dominic, Nancy and Rose, three children of the Acholi tribe in Northern Uganda, which is one of the worst areas affected by the Civil War / LRA. Disarmingly beautiful, but covering some absolutely harrowing stories that are impossible not to be moved by, re-watching War Dance in light of recent events made me feel as though I should share this other perspective of recent history in Uganda. Being a bit of a music nerd, the joy and cathartic benefits that music and dance brought these children and their wider community was pretty powerful. I’m not going to question the “awareness” or “education” benefits of students in the West buying Stop Kony packs and arranging rallies, but witnessing the difference that owning a simple xylophone made to Dominic, I couldn’t help question the focus of those efforts. Frustratingly, War Dance is practically impossible to get hold of in the UK. I have, however, found a YouTube channel which has uploaded it in ten parts, the first of which is below (if you click on their channel you’ll see the others). If you have chance, please take the time to watch it. On the weekend we had the pleasure of a parent of the His and Hers in town visiting. As a bit of back story, this particular parent, who resides in deepest darkest Devon (and has never lived in the big smoke), somehow seems to know and have her finger on the pulse of everything that’s achingly cool in the city. So whereas most children may dread the arrival of their parents for a weekend, we look at it as an opportunity to raise our “cool” stakes amongst our peers. 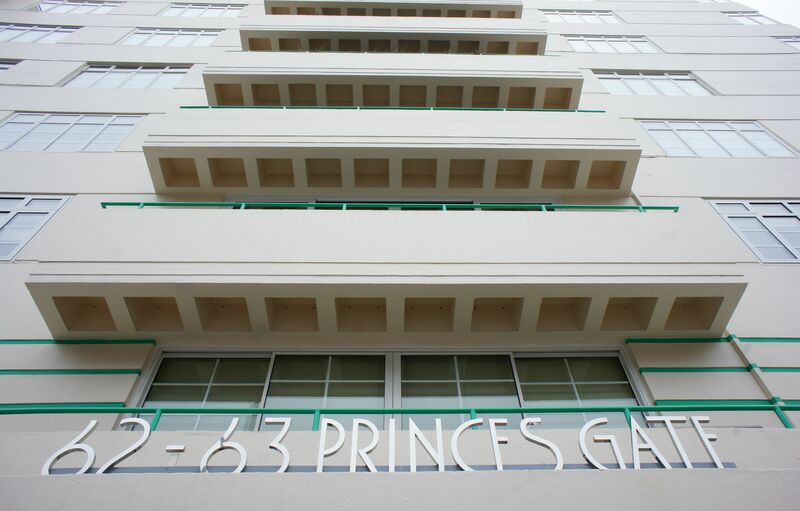 We were informed that this weekend’s agenda was to begin with a stroll down the recently re-opened Exhibition Road to take in the latest example of shared space urban planning, as well one their favourite art deco buildings in the city. Our destination was the V&A for the opening day (our guide thought it had been open for weeks) of the British Design 1948 – 2012 exhibition. But before we had even got in the door our eyes were being opened with more facts from our London oracle. 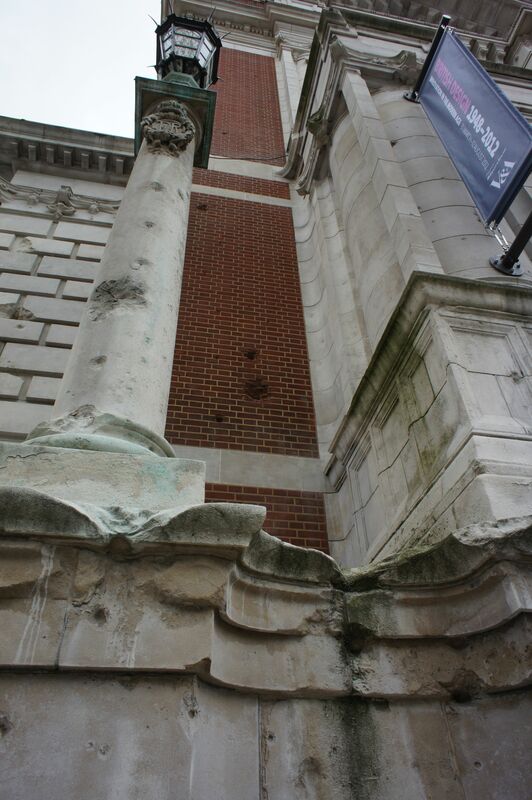 The photo below is of the wall on the Exhibition Road side of the V&A, which to this day still has multiple and considerable shrapnel scars from the Second World War. Quite a frank reminder of how the war affected some of our greatest buildings. As for the exhibition itself, the word I’d best use to describe it is ambitious. Covering a huge range of styles, influences and designers, it was always going to be difficult to do justice to all of the eras covered. It felt as though some eras went into quite some detail (the Fifties in particular), then others were skirted over in a slightly haphazard fashion. 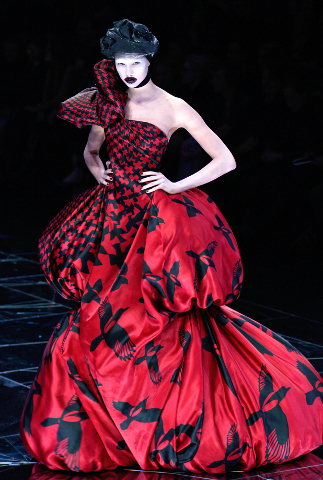 However, the surprise for me was fashion design, in particular the dress below by Alexander McQueen from his Horns of Plenty collection in 2009. Being aware of his importance in the fashion world, but never having really seen or paid that much attention to his work, seeing this dress up close and understanding its design direction was an eye opener. The example above was inspired by the houndstooth pattern often used by Chanel and Dior, and up close you really see the flow of the concentric patterns expand and change across the dress into magpies circling. I couldn’t help but be reminded of MC Escher. In a Jubilee and Olympic year this exhibition is definitely worth visiting just to understand how the period after the war (the Olympics and Festival of Britain) kick-started modern design in the UK. With some great talks also coming up too, including such design luminaries as Paul Smith, David Bailey and John Hegarty, go make yourself feel proud to be British. Last night we had the pleasure of attending the opening of Gillian Wearing’s new exhibition at the Whitechapel gallery covering an array of the Turner prize winning artist’s video and photographic work. I’ll happily admit that I sometimes find video pieces a little difficult to get my head round, and some of these definitely fell into this category for me. “10–16”, where adults lip synch to children’s voices, is entertaining and slightly sinister in equal measures..
What I was really looking forward to was her photography work – especially the series “Signs that say what you want them to say, and not Signs that say what someone else wants you to say“. 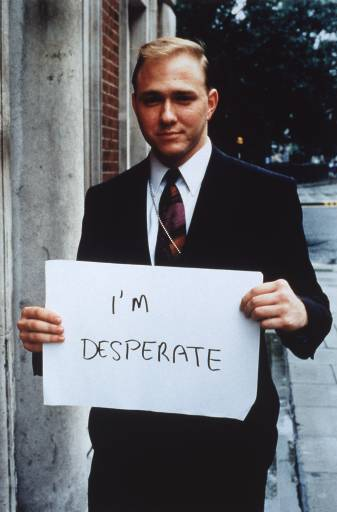 These photographs taken in 1992 cover a whole spectrum of characters across the capital. The contrasts and unexpected nature of individual thoughts are really engaging, and now 20 years later also provides a really interesting piece of insight into the “state of the nation” at that time. The other reason you should visit the gallery is to see the Government Art Collection – this 4th display from the 13,500+ pieces that the government owns has been curated by members of staff (PAs, cleaners, IT managers etc.) from No.10 Downing St. who experience the art every day. And I have to agree with Diane, a PA at No.10, that this piece by John Virtue in the display really does stop you in your tracks. Mention North Devon to most people, and learning to surf and the Tatler magazine ‘hot spot’ Croyde beach will probably be the focus of their attention. However nestled around the coast, away from the wetsuit clad crowds is one of my favourite spots in the southwest, Ilfracombe. 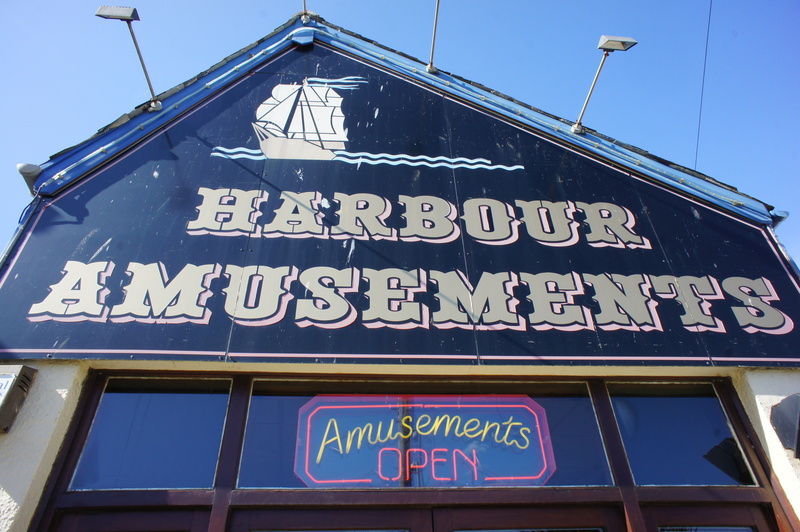 A holiday hotspot for Victorian England, the town has fallen on harder times of late, but the slightly down at heel edge to the town adds buckets (and spades) of character to its truly picturesque location. The best way I can describe it is it’s like Padstow without the Jack Wills hoardes cluttering the pavements gnawing on pasties. 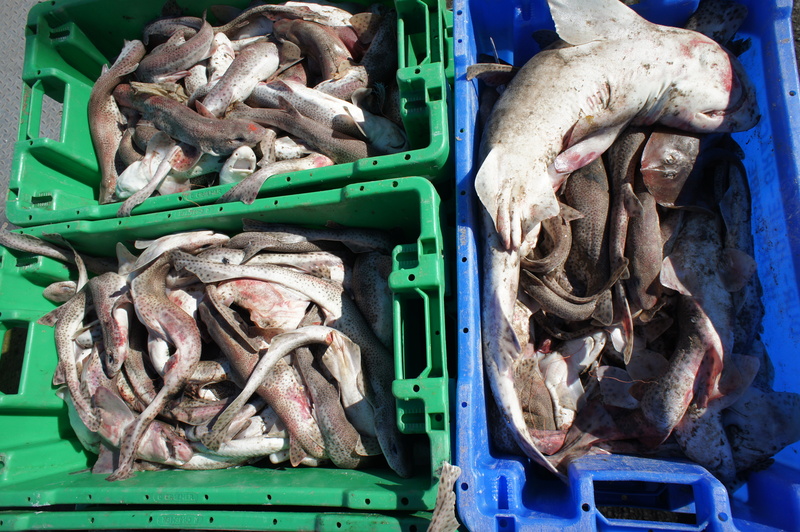 A slightly more famous fan of Ilfracombe is Damien Hirst, who after moving to the area opened 11 The Quay a few years ago. 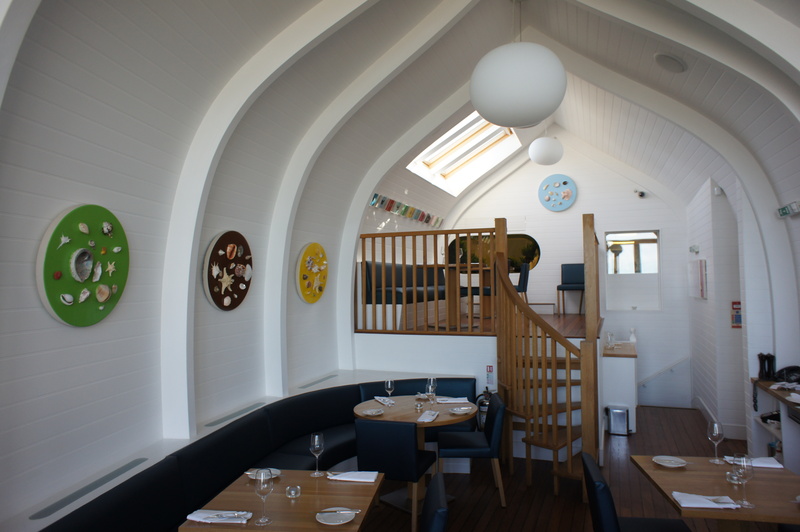 With its interior influenced by its nautical surroundings – note the ship’s hull inspired ceiling, the restaurant has more Hirst art in it than a retrospective at the Tate. Within the spectrum of food available in North Devon it’s a pretty good standard, and fairly reasonably priced at that. What I can’t understand is that every time I visit is how there’s always space in the restaurant. I’ve personally never had a bad meal there, so I’m not sure why it doesn’t receive better patronage. Unfortunately I can’t help but feel as though if its owner wasn’t the highest earning living artist it may not have lasted as long as it has.